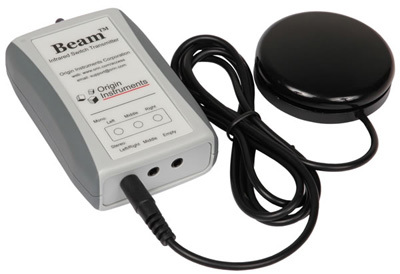 Beam allows a HeadMouse™ Nano user to actuate the left, right and middle mouse buttons using adaptive switches without a direct connection to the HeadMouse. When used with a Swifty™ Beam sends up to three button events that Swifty interprets as mouse buttons, joystick buttons or keyboard keys based on Swifty configuration. Beam uses low power infrared light to communicate with the HeadMouse Nano or Swifty much like a television remote control. A receiver is built-in to the HeadMouse Nano and is located near one of the HeadMouse logos behind the small window. A receiver is also built into Swifty and is located under the window in the overlay. Beam has internal batteries that will provide months of typical operation. The switch jacks accept industry standard adaptive switches, which use 1/8-inch (3.5-mm) plugs. Single and dual switches with mono or stereo plugs may be used with Beam. For example, our Sip/Puff Switch may be used with one cable to Beam for left and right mouse buttons. 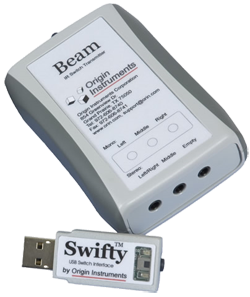 Beam is generally used by those with adaptive switches that wish to break the hard connection between the switch and the HeadMouse or Swifty. Often this is a power wheelchair owner that wants independence from an attendant for connecting and disconnecting his or her switch from a desktop computer. Tired of wires? Beam can team with Swifty, allowing users to remotely activate mouse clicks, joystick buttons or keyboard functions. Don't be tied down - let freedom reign.